Happy spring to one and all! Today felt very springlike up here in Alaska. The snow that has piled up over the past few weeks was soft and slushy, eaves and gutters dripped with snow melt, wooded areas were alive with calling birds and there was a palpable energy “springing” forth from all of the places and people I visited with today. My midwife came by today and delivered a few things for the upcoming birth of Baby Wilder #3 who should be here within the next few days or weeks! We are now playing the waiting game. I’ve had some significant contractions, but nothing even close to consistent…just my body training for the real deal. It is pretty amazing what the female body does to keep the human race chugging along! 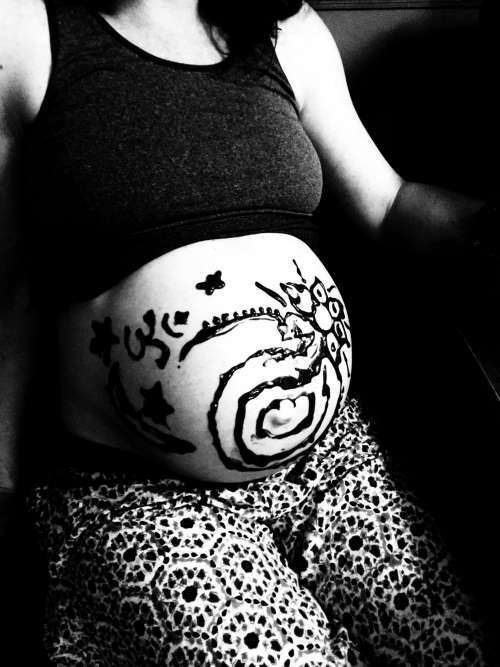 My big decorated belly. Baby Wilder is still cooking away!